We had a delightful time recently with Father Dominic Bump, OP, one of the newly ordained Dominicans from St. Joseph' Province. He replaced our chaplain for a week after his priestly Ordination. During that time we were able to visit with him in the parlor and hear the fascinating account of his conversion and eventual vocation. It was a beautiful story of God's loving call and His direction in our lives. Fr. Dominic also treated us to a class on devotion to Mary. He used several of the saints as examples of how powerful Our Blessed Mother can be in our lives, and was a stimulus to renew our trust in her guidance. Before leaving, Fr. Dominic gave us a special blessing, calling down God's grace on our community and asking for many new vocations for our monastery. Another visitor who was passing through is Fr. Boniface Willard, OP. After serving at Blessed Sacrament parish in Seattle, Father is now assigned to campus ministry in Los Angeles. As he was moving his things on his way south, he stopped for a visit with us in the parlor. At that time he shared his experience of the recent Ordination ceremony in San Francisco when two of our Brothers became priests and two others were raised to the diaconate. We always enjoy the friendly visits of our Dominican brethren. Yesterday, as we began the Entrance Hymn for our morning Mass, our voices were joined by a descant from the rafters. A little bird had flown into our choir and enjoyed our music. He sang along with us, happily praising God for the wonder of his being and the fine perches for him to rest on. As the day wore on, he flew from perch to perch, carefully dusting all the areas that we cannot ordinarily reach. When finished with his cleaning task, he was tired and thirsty. We placed a dish of water on the floor near the open door to show him the way out, and finally he went back to the great outdoors to rejoin his family in the treetops. into our monastery garden. 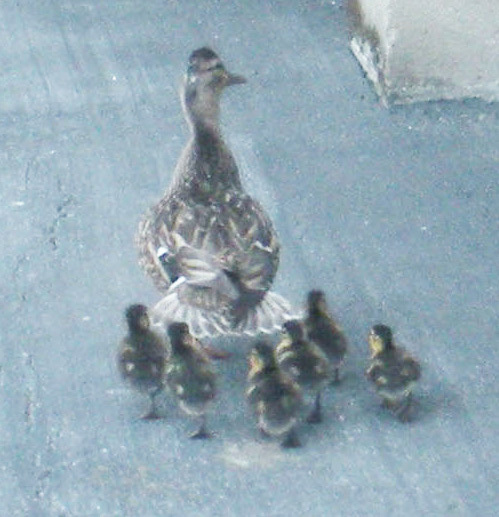 She led them along the path, probably headed for the pond at the City Library a couple of blocks away. But they met the enclosure wall, and although Mama could easily fly over it, the babies were stopped. So she bedded them down for the night in the grass near the barn. 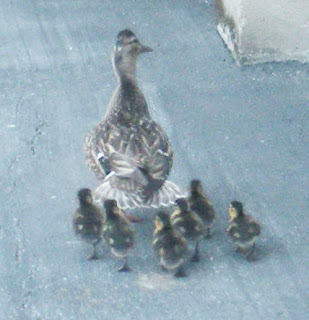 Mama Duck disappears every now and then, and the number of babies is decreasing, so we think that she is air lifting them over the wall to get them on their way to the pond, where most likely, Papa Duck is waiting for them. 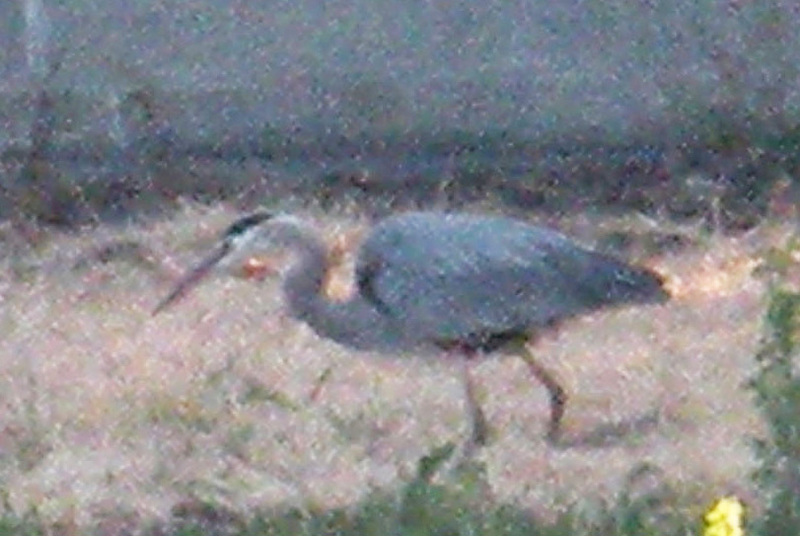 Last, but not least, is the most recent visit of our friend, the big Blue Heron. Every few months he comes by and stops for a while on our grounds, where he simply checks things out and rests a bit before his next flight. 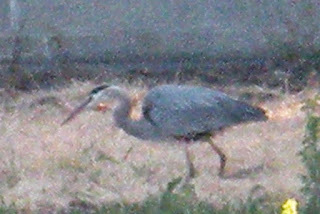 We don't know where he comes from or where he is going, but it is possible that he, too, is headed for the pond at the City Library. These are a few of our visiting critters this summer. The Lord takes care of each and every one of them, just as He does for His beloved people. The last few weeks have been rich with beautiful feasts and glorious celebrations. On June 2 we celebrated our patronal feast of Corpus Christi. On this occasion fifteen of the Dominican Friars joined us in a magnificent tribute to Jesus in the Holy Eucharist, with a beautiful sung Mass followed by a procession and Benediction of the Blessed Sacrament. A few days later there was the Feast of the Sacred Heart of Jesus. Again we had a beautiful Mass to celebrate the love of God incarnate in the person of the Man, Jesus. He loves us so much that He wants to live with us as a human person and experience the joys and sorrows, pains and pleasures that we experience in our ordinary daily life. He knows us and wants to be part of our normal activities. On this feast of love we were privileged to have the First Mass of one of our new Dominican Priests, Father Dominic David Maichrowicz. Joining him for this joyous occasion was Brother Peter Junipero Hannah who is one of our two new Deacons. He and Father Dominic were ordained in the same ceremony the previous Friday at St. Dominic's in San Francisco. 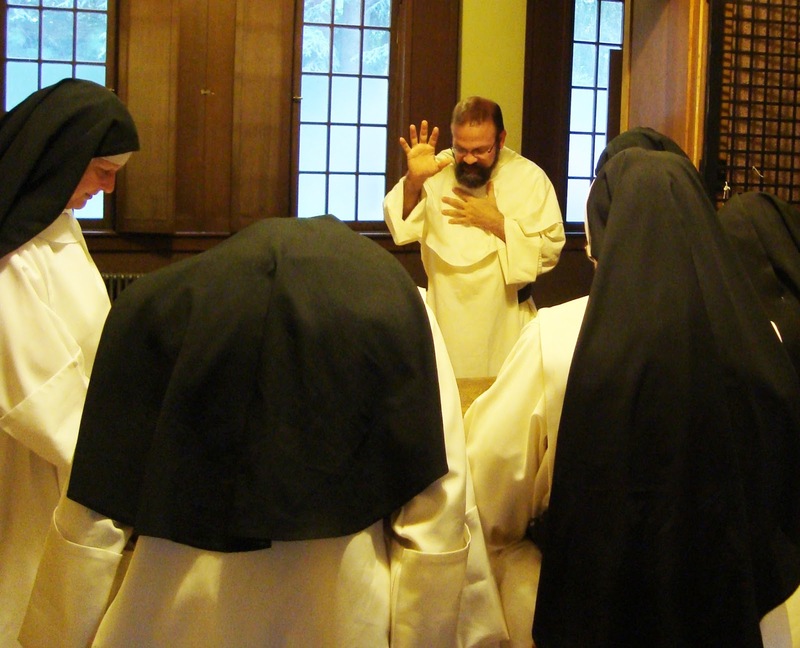 After the Mass the nuns joined the friars in the parlor for a delightful fraternal visit. 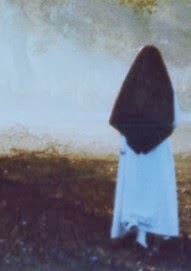 We love to follow with our prayers the spiritual journey and ministry of our Brother Dominicans.